Trends touch a broad segment of the population Indians are more engaged on mobile devic.. Marketers need to abandon outdated assumptions With growing internet penetration and wi..
1. Mobile First This first mobile generation is much more likely to use .. The term millennial describes a generation born between 1981 and 2001. People born at the start and .. But confidence varies by income, city, and category Indian consumers are send..
1. Heritage Growing cultural pride and patriotism are influencing consumer prefere.. Shoppers seek authenticity and value Indian consumers exhibited confidence, but sentime.. They dream big and change businesses and peoples’ lives Amarjeet Tha..
Customers expect brands to link commerce with social conscience Sonya Misquitta A.. Initiatives help build both economic and social value Sunil R. Shetty Senior Vice..
Brands must remain consistent, while adapting to new India Arnab Bhowmik Vice Pre..
Consumer attitudes and beliefs inform brand visions and tactics Shaziya Khan Seni.. Openness, consumer engagement strengthens brands, earns trust Hareesh Tibrewala J..
More Indian brands now combine multiple services on a single app Varun Jain Resea.. Mobile habits, ad blockers require creative responses from brands Milind Pathak C..
C-SUITE Q&A: Ajay Kakar, Chief Marketing Officer, Aditya Birla Capital Ltd. Brand simplifies, adds convenience to underpenetrated product category New strategy aim..
C-SUITE Q&A: Suparna Mitra, Chief Marketing Officer, Titan Company Ltd.
With rising wealth, Indians buy watches for special moments as well as occasions ..
C-SUITE Q&A Brand tailors mix to match Indian consumers’ rapidly cha..
Brands adapt consumer insights, category surges New models combine style a.. The BrandAsset Valuator (BAV) is a study of consumer brand perceptions, measurin..
India ranks moderately in influential attributes BAV analysis of..
India ranks high relative to fast-growing markets Its Citizenship rank presents a ch.. Ever more rare and critical, trust is the new currency by Siddhant Lahiri Head - ..
India’s market size and diversity demands long-term commitment Aditya Kilpady ..
Planning, data, analytics help assure a positive experience Karthik Nagarajan Hea..
Brands solve problems, deliver excellent customer experience Par..
Brands need to unlock the stories that exist in the hearts of consumers Sanjana Math.. Greater affluence and younger population drive the change Dia Ki..
Young Indians expect the best, and will change quickly to get it Divya Khanna Vic.. The best brand stories relate to consumers’ personal stories Anvar Alikhan ..
FMCG slows, but telecom grows The BrandZ™ India Top 50 grew a robust 21 percent in b.. They spend more on FMCG than others Indian marketers rely on a Socio-Economic Classificat.. Brand found in 100 million households In India, the brand Patanjali is synonymous with disrupti.. Greatest potential remains in rural areas Internet use in India continues to grow, but the grow..
Travel dominates categories purchased online With accelerated growth, e-commerce in India..
Consumers stick with their preferred brand As e-commerce rapidly increases in India, local and .. Mobile payments rise after demonetization Increased demand for messaging services, social media..
As overall spending eases from prior year Spending on digital media is expected to increase 30 ..
Market strength, insightdrive high value growth Automobile and financial brands predomina..
Digital growth drives telecom and entertainment brands The highest-ranking newcomer to th.. Ranking remains consistent year-on-year Brand Contribution, a BrandZ™ metric, measures th..
Five health indicators comprise Vitality Quotient To rank in the BrandZ™ Top 5..
Outside perception of India may lag economic progress Country ranks higher on culture tha.. 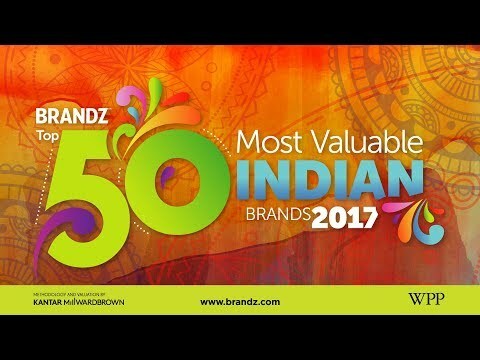 This analysis of Brand India is based on the Best Countries 2017 study, developed by Y&R&r..
Soft power is key driver of a nation’s brand value India’s lower rank is incon..
Business decision makers rank China higher in key attributes But is India positioned..
Trust and Daring form powerful brand tension Together, attributes produce engaging brands.. BRAND INDIA Case Studies Brands combine trust and daring in creative tension Two..
AQUA COMPANY Danone SABRAND VALUE US $564 millionHEADQUARTERS JakartaYEAR ON YEAR CHANGE ..